If you haven't realized by now, we're just a small speck in da Pacific Ocean completely surrounded by watah. One of da things dat makes Hawai'i nei such a wonderful place to live, work and play are da beaches. I grew up literally on da beach. Believe it or not, shmall kid time I used to live in Sand Island wea my dad built a house next to his auto body shop and my 'neighbor' and I used to hop da fence and were body boarding in mere minutes. Even though Sand Island was a man made island, I still remembah black specks being in da sand and always left my hands 'dirty'. Da sand was a lot more coarse than wat you see anywea else so it wasn't like da fine sand beaches on da Windward side. Or at least das wat you think eh? 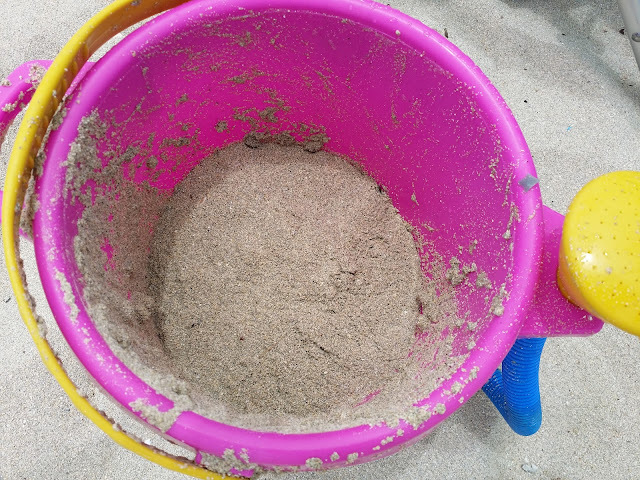 Da Keiki asks me to get a bucket of sand so as da evah loving Daddy, I do. Da Keiki: Daddy, you need water in there silly. Da Keiki: Thanks Dad but you got dirty water. 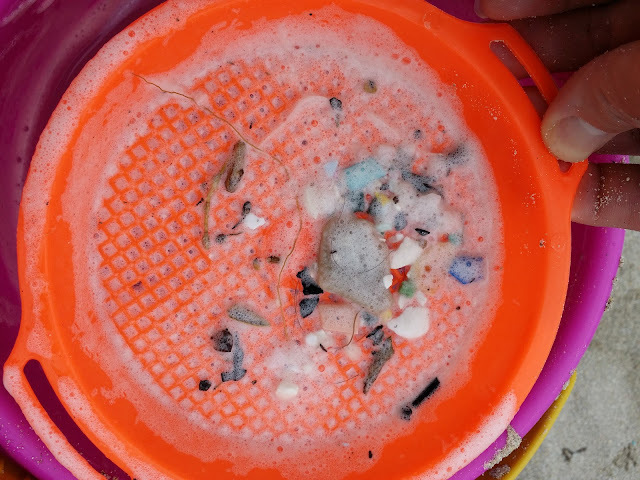 I couldn't believe one of da most pristine beaches in Hawai'i was dis, um, dirty! Granted it's not Kailua or Lanikai but it is along da same stretch. I haven't been to either in ages because of da crowds but our "secret" beach didn't look so appealing anymore. 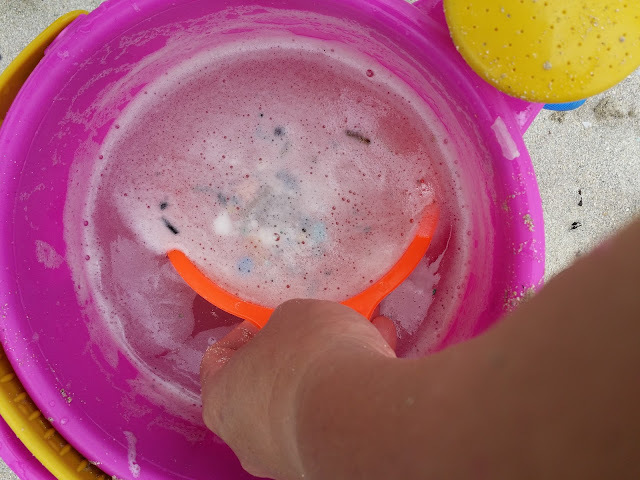 It wasn't just one bucket full of sand either. No mattah wea I walked to scoop up, it all looked da same - "dirty" watah exposing da debris laden sand. To tell you da truth, we nevah think too much of it cause we grew up in da same sand all ovah da island. As long as they weren't ingesting it, it was ok but still, it was pretty disturbing to have made dis "discovery". Have you evah noticed anything about da sand at da beach(es) you go to? Does some feel "cleaner" than oddahs? And to make mattahs absolutely classic WWD!, aftah packing up da cart and tugging it through about thirty yards of thick sand, I felt something squishy and wet between my toes...... and it wasn't da sand. My recent memory can't evah recall a summer like dis wea it's been soooo humid for choke long periods of time. We not talking about a day or two or three but going on weeks at a time of muggy, sauna-like, arm pit staining, pants sticking to your inner thigh kine of weather. And let's not fo'get about having to feel like needing to change your underwear if you've dared walking around outside for anything ovah five minutes. It's a good thing we surrounded by watah but even then, it's just a temporary fix as you can't stay in there forevah. Last week in conversation, a few people brought up da weather and I asked them wat they were doing to stay cool as it was ridiculously unbearable. Most of them said blasting their fans on full, heading to da mall or theaters and it didn't mattah if it costed them money but anywea with a/c would top da list in a hurry. Obviously all logical choices but I threw something at them they all were surprised to hear. I asked, have you drank any hot tea? It's actually a debatable method but think about. In all da movies situated in scorching areas like da Middle East or India, their drink of choice - even on an insanely hot day - is hot tea. Da premise in a nutshell is dat there are these nerves in our tongue and mouth which wen drinking da hot liquids, sends signals to your body to cool off by.... sweating. Would I drink hot tea on a hot day? I ain't dat nuts but I can only assume everyone's natural instinct to grab a cupful of ice and pour their favorite non-heated beverage in. Wat have you done to cool down: shave ice, cold drinks, Ice Palace? Have you been able to sleep well or do you have multiple fans on you? Have you changed your sheets or at least your pillow case aftah having perspired like Akaka Falls? Does anybody drink hot liquids on a hot day? Kinda same thing like going to eat saimin on sweltering days too no? There are a LOT more murder's happening in da 808? Get choke stabbings happening wen no mo' gun for shoot 'em with? TheBus stay way ovah their quota of running ovah people? Convicts and criminals in custody...... are escaping too easily? Most - not all - politicians just "look" crooked? Banks must tink I'm either going to rob them or be of da criminal element cause most times I go in there, I get da "treatment". Well, not in a bad way but if I not going out to wea I gotta wea nice kine clothes, I'm usually wearing shorts, t-shirt, slippahs and a hat or visor. Today wasn't any different... but was. Standing in line at the Hawaii USA FCU in Aiea, I watch people - as I normally do anywea - and wait my turn listening for, "next in line please". TELLER: (Starts to enter da deposit then gives me a quick side eye glance) Could you please remove your hat? BL: Sure (although I was wearing a plain Oakley visor)...... but you didn't ask the guy you just helped to remove his. TELLER: I didn't help anyone with a hat. TELLER: I didn't notice. I'm usually pretty good about that. BL: Really? You didn't notice his huge hat? I'm just asking to be fair is all. TELLER: Sorry, guess I missed it..... is there anything else I can do for you? Really? Not even I'm sorry but just sorry dat you missed it? I totally get banks asking to remove your hat and sunglasses and I do my best to accommodate before reaching da teller by putting my shades on my head, tilt my hat a little higher so my face is CLEARLY visible and look at several cameras directly and smile (yes, I really do dat) but really, why should I remove my hat? It's part of my dress, just like how wahines wear accessories, but until they upgrade their stupid cameras, it doesn't mattah cause you can nevah see da face clearly anyways! How many times have they shown da person robbing a bank and you can't even tell if it was your dog sliding a note to da teller demanding money? In dis day and age of technology, you should be able to count how many white hairs are on your head from all their cameras in da bank yet alone be able to see a non-pixelated photo of a robber. "Peole just don't like you".